Veteran fans have lived a long stretch of life inside the Harry Potter world. And this time author Rowling adapts her own work in her debut screenplay, etching some very fine characters. While this was a fictional Hogwarts textbook that Rowling wrote about fifteen years ago that bears the same name, ‘Fantastic Beasts and Where to Find Them’, this movie is not so much an adaptation as it is the story that tells of how the author of the textbook, Newt Scamander, wrote it. Director David Yates needs no introduction after having helmed four of the eight Harry Potter movies; he’s an old-school teller of Harry Potter tales who specialises in giving audiences lumps in their throats. His are always satisfactory on-screen portrayal of the text; the movies are with their edges sanded off and their seams showing, the films unashamedly lacking in subtlety because he chooses to paint only in broad-strokes. Essentially, this movie details the story of Newt Scamander, a magical zoologist who’s traveled the world in order to find and document rare creatures, which he carries in his magical suitcase. The movie makes the fact clear that ‘the magic awakens’ in a manner that is destined to thrill the dedicated fan base and ignite the passion of new fans. J.K. Rowling’s first effort as a screenwriter is a wild success, with her keen eye for detail which is enough to engage audiences and keep them enthralled. Her compulsive creative energy has already made her the auteur of a series far more than any director could be. We are transported back to 1926 New York, during the height of the Jazz Age, where Rowling lifts the veil on the American Wizarding World for the first time. Scamander (Eddie Redmayne) who has newly returned from Africa lands in New York for research purposes with regard to fantastic beasts. However, his battered old suitcase (a forerunner of Hermione Grainger’s bag, which was probably borrowed from Mary Poppins) gets exchanged with a similar looking briefcase of muggle Jacob Kowalski (Dan Fogler), a war veteran-turned-factory-worker who wants to be a baker. Kowalski opens Newt’s suitcase and inadvertently lets loose four magical creatures into the streets of pre-Depression New York City. While Kowalski, Scamander, Tina Goldstein (Katherine Waterston) — a recently demoted “Auror” relegated to the wand permit department — and her charismatic sister Queenie (Alison Sudol) are in the exhaustive magical-creatures search and capture, malicious and powerful dark wizard Gellert Grindelwald (Johnny Depp) causes great vicissitudes, which will be connected ominously with animal chase in North America. There’s also an eerie anti-witch activist Mary Lou Barebone (Samantha Morton) and her adopted son Creedence Barebone (Ezra Miller) running about in the town, spewing venom about witches. Mysterious occurrences take place throughout New York City that threaten to reveal the secrets of the magical world to the muggles. Initial blame is directed towards Gellert Grindelwald, the Dark Lord that a certain Albus Dumbledore defeated to put himself on the map. Chief Auror of Magical Congress of the United States of America (MACUSA) Percival Graves (Colin Farrell) investigates, aided by the creepy-demon child Creedence and his mother both of whom are leading a crusade called Second Salemers against witches and wizards. Movies, based on J.K. Rowling’s novels, have become self-perpetuating and even hegemonic: fans know how they’re supposed to react, and they do. The frames are filled with intensity, emotions run as high as the action. It’s a movie with loss and solitude at its core, with characters questioning their alliances and teetering on the brink of uncertainty. This is a far cry from the fun-filled “wizard kids” films. It’s about young adults facing a potential future of darkness and isolation. The beautifully ornate production design shines through every frame, whether Manhattan’s old City Hall subway station where the climax unfolds to the seedy underground jazz club with all manner of peculiar (if slightly grotesque creatures too). The special effects are equally stellar, particularly the transition from our world to the inside of the suitcase, and a breathtaking scene where the Obscurus wrecks destruction across several New York’s skyscrapers before plunging into the City Hall station. Scamander’s suitcase is a world unto itself; Scamander has created a sanctuary for his magical creatures in the briefcase, with the help of undetectable extension charm. In discovering the menagerie of creatures that Newt has hidden in his suitcase, there is absolute delight; among the creatures there’s a scene-stealing platypus with a penchant for stealing shiny things, a tiny stick-like green insect that can pick locks and a majestic avian which changes shape and size to fill any available space. Newt takes Kowalski on a well-directed tour, where he sees how each beast is unique, and also uniquely misinterpreted and feared, and thus killed by humans. Kowalski’s astonishment is our own, but he refuses to think of it as a dream. He says “I ain’t got the brains to think this up,” and that pretty much sums up how marvelous Rowling’s imagination is, and gives us an idea of what to expect in the remaining four films in this series. And of course, the close-ups of the various beasts are just as visually exquisite; some scary, some cuddly, some ethereal and some just downright goofy. Even without the appeal of adorable young children, ‘Fantastic Beasts and Where to Find Them’ is pure enchantment, perfectly setting the stage for a whole new chapter of the wizarding world we’ve come to embrace through the ‘Harry Potter’ films. To call it fantastic may be slightly hyperbolic, but you’ll be glad to know it doesn’t fall too far short. Yates shoots in stunning, swift strokes. And every time the customary fireworks between good and evil threaten to look routine, the good acting consistently lifts the film. It’s mesmerising how well cinematographer Philippe Rousselot manages to keep the main characters in focus by manipulating them seamlessly toward the middle of the frame, forcing us to look at them even as they stare at the beasts. 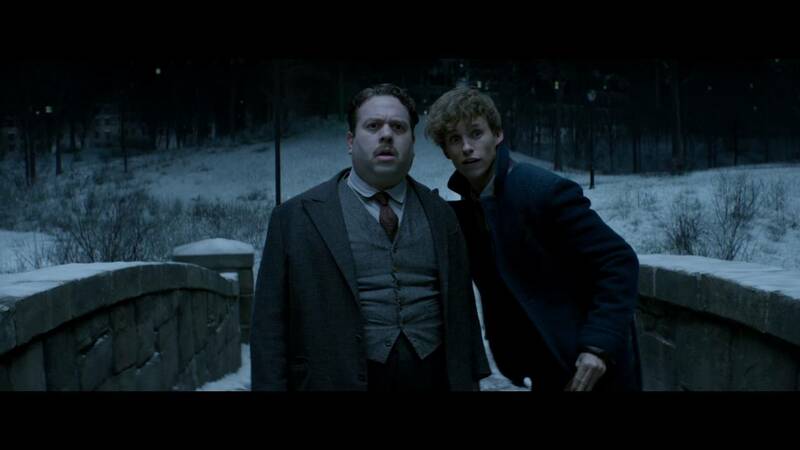 Most of the film is indeed overwhelmed by the effortlessly endearing Eddie Redmayne and Dan Fogler, one quirkily adorable as the shy and slightly awkward boy-man and the other an unassuming muggle (No-Maj) bumbler with eyes wide open in wonder. 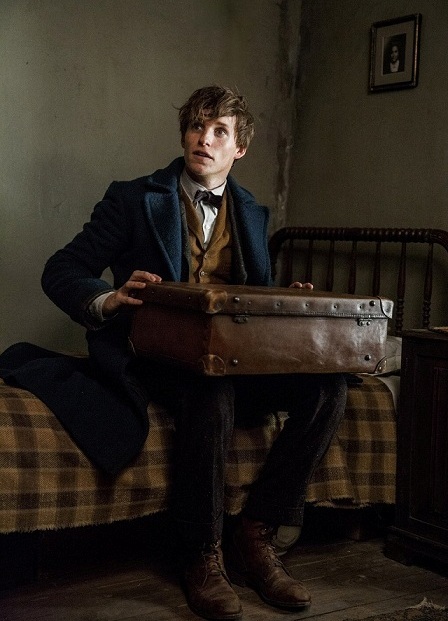 Eddie Redmayne doles out exposition and theory with a smart everyman curiosity. Like a soft Sir David Attenborough but with the mannerisms of a clumsy Lee Evans, the script makes him quite likeable even though his expressions don’t allow much sanity. Fogler is easily the most watchable and enjoyable; the humour that he brings to Kowalski‘s character livens up a film that mainly follows a linear path with scant room for delicious subplots. Colin Farrell alternates between being genuinely oddball and weirdly derivative. Katherine Waterston, with bright eyes and sharp expressions, is efficient and cool and inch-perfect. Alison Sudol as Tina’s sister Queenie is impressively sensuous and consistently credible. Ezra Miller gives an uncomfortably stark performance as Creedence, making the most of each shadow and each secret, feeding us lies and making us read between them. A surprising cameo by Johnny Depp as Gellert Grindelwald at the end of the film’s climax is sure to win many hearts. The standout character is, somewhat surprisingly, the small, furry and oh-so-cute kleptomaniac nifty Niffler, who possesses a love for shiny things, purse buckles, coins and jewellery. Before things get serious, the early scenes with Newt and his unlikely companions pop with escapist fun, not least when he and Jacob get caught in incriminating situations by law enforcement while pursuing the cute-little-beast around bank vaults and jewellery stores. Fantastic Beasts and Where to Find Them is a film that stays long with you, and one that refuses to put a fun spin on things, Yates preferring instead to put the ‘magic’ in ‘memories.’ The movie ends on a surprisingly heart-warming note. It’s one visual treat, an engaging film that keeps your pulse racing.